RSPB Scotland have today issued an appeal for information after post-mortem results confirmed that a hen harrier found dead on a grouse moor in south-west Scotland in late April had been illegally shot. 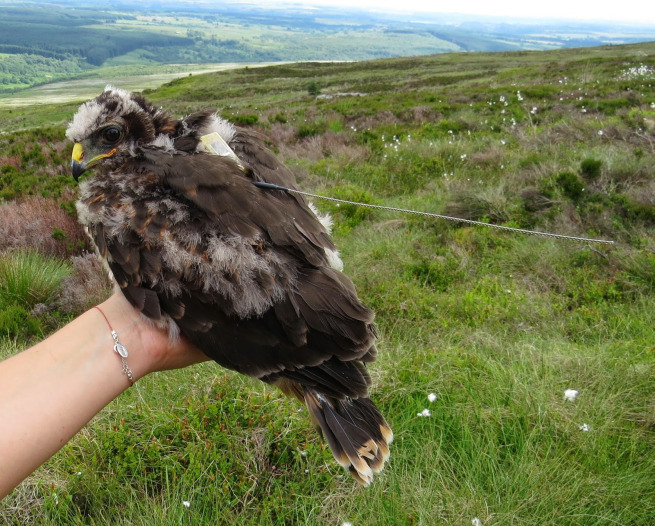 The young female harrier, named “Annie”, had been fitted with a satellite transmitter as a chick in the nest as part of the Langholm Moor Demonstration Project. Scientists monitoring the bird became concerned in mid March 2015, when data confirmed that the bird had stopped moving. Annie fitted with her satellite tag at Langholm, this technology proved conclusively what happened to this Hen Harrier. What has happened to the dozens of additional Harriers that were not fitted with similar tags? After extensive searching RSPB Scotland Investigations staff, liaising with Natural England and Police Scotland, recovered the body of the bird at the end of April and submitted it to the SAC Veterinary Centre laboratory near Edinburgh. Results received in the last few days now confirm that the bird had been shot. 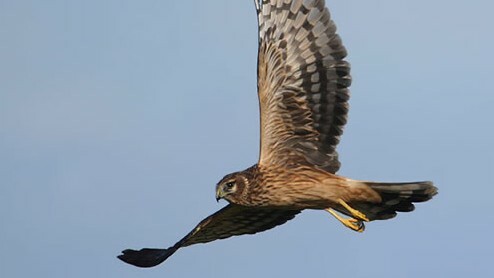 The hen harrier is one of the UK’s most threatened raptor species and declined by 20 per cent in the period 2004 to 2010. Very few pairs now nest on areas managed for driven grouse. The shooting and then recovery by Scientists of Annie underlines the reason why all nestling Hen Harriers must now be fitted with a satellite tag as a priority, irrespective of any costs involved. We are currently spending millions of pounds on initiatives like the Langholm Demonstration Project in the Scottish borders, what is the point if fledged Harriers then disappear and cannot be found because they had not been fitted with a satellite tag? Scottish Minister comments on bird of prey shooting. “It is extremely disappointing to hear the news that Annie, one of the satellite tagged hen harriers from the Langholm Moor Demonstration Project, has been shot. “The Scottish Government remains absolutely committed to working with law enforcement and others to bring an end to this outdated criminal activity. I expect all right minded people involved in the countryside, including with shooting, to agree that wildlife crime has no place in a modern Scotland. I would urge anyone with any information on the latest incident to contact Police Scotland as soon as possible. “We have been taking action, including seeing the first successful vicarious liability prosecution, and the review of penalties will be reporting in the near future. We have committed to an examination of the regulation of the game shooting industry sector elsewhere and have made clear that, though it would be complex and require primary legislation, the licensing of shooting businesses in Scotland remains one of the options that could be adopted.